Visit several popular sightseeing spots in Gifu and Nagano prefecture on this overnight trip from Tokyo. On the first day you will visit "Iwamura castle town" where old traditional stores and houses remain and "Gujo Hachiman" in Gifu Prefecture, a castle town built around crystal clear water canals. On the second day, the tour continues to three other destinations: the traditional village Shirakawa-go, with its unique farmhouses; the historic city of Hida-Takayama; and the mountain resort of Kamikochi. After departing from Shinjuku (7:50am), you will head to Gifu Prefecture by bus via expressway. The first destination is Iwamura Castle Town, a quaint town located right on a mountain slope. The castle town was an important cross point for politics, economy and culture during the Edo era and it has been registered as an “Important Preservation Districts for Groups of Historic Buildings". Old houses and shops still exist in the town. You will have around 1 hour to explore. A boxed lunch option is available for this tour for an additional fee. You can choose among ① Lunch A : Nozawana pickles & cutlet sandwich (JPY680 tax inc.) or ② Lunch B Kobuchizawa Marumasa's chicken rice (JPY980 tax inc.) If you would like to order either, please select the "Lunch" option at the time of booking. Then, you will head to Gujo Hachiman, another popular yet authentic small town in Gifu Prefecture. Gujo Hachiman's waterways are the pride of its citizens, which still functions the same way as back in the 1600s. The water is so clean that it's still used to wash food and laundry today. You will have around 90 minutes to stroll around these picturesque streets and imagine what daily life for citizens in 17th century Japan was like. After exploring the town, you will head to Washigatake Kogen Hotel Rainbow to have dinner and stay overnight. 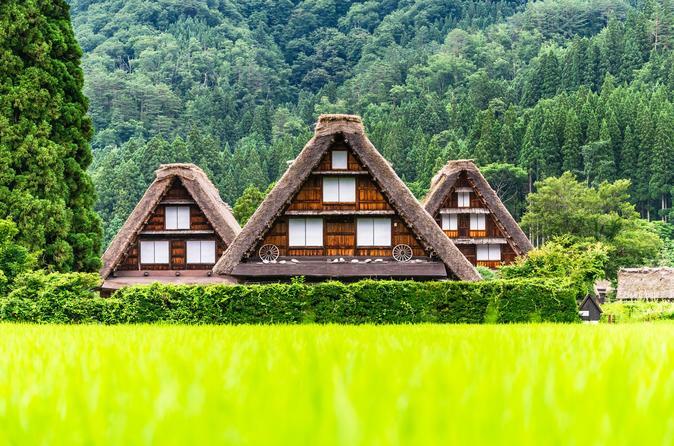 On the second day of the tour, after having breakfast at the hotel, you will head to Shirakawa-go, arguably the most famous sightseeing spot in Gifu prefecture which has been declared a UNESCO World Heritage Site in 1995. Shirakawa-go is famous for its traditional gassho-zukuri farmhouses; “gassho-zukuri” means “constructed like hand in prayers”, because the roof of the houses resemble a Buddhist monk's hands pressed together in prayer. After around 1 hour, you will have a Hida beef roll sushi bento lunch box and then head to Hida Takayama, a quaint town also known as “Little Kyoto”. The streets of the town's historic district are lined with wooden houses dating back to the Edo Period, and you can relax by taking your time to walk around for approximately 1 hour. The last destination of the tour is Kamikochi, a popular mountain resort located in Nagano's Azusa River Valley and surrounded by high mountains. You will have around 80 minutes to explore this stunning destination and its spectacular scenic views. This beautiful area is only open to visitors from April through November. The best way to discover it is to go hiking on the trails along the Azusa River and see the clear water flow between the mountains and trees, creating one of the most beautiful valleys in Japan. You will also be able to see and cross Kappa Bridge, the symbol of Kamikochi, located at the heart of the resort. You will then head back to Tokyo around 19.30.